Serena McMahon '18 studied abroad as a junior in Cape Town, South Africa. 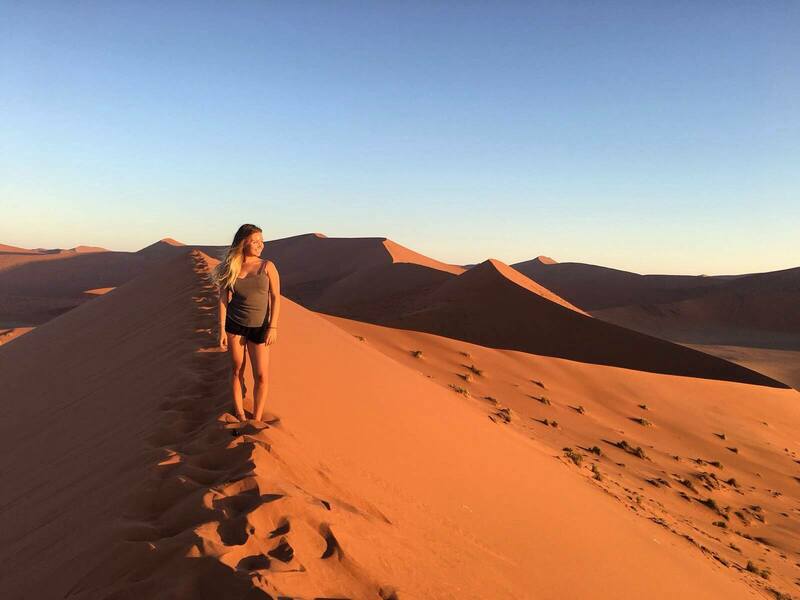 During her travels, she visited Dune 45 in Sossusvlei, Namibia, which is considered part of the Namib Desert. We recommend that students consider a course or exchange program that provides experience abroad. Few courses can deliver the impact of an international experience, which tends to strengthen your language skills, your understanding of other cultures and your sense of history and economics. The International Programs Office can help you arrange a semester or a year abroad. As you plan, remember that very few countries teach journalism in their universities. You can find excellent journalism departments in many Australian and Canadian universities, and several British universities offer some journalism instruction. Other countries may offer a few courses that satisfy a journalism elective requirement—you will need to get prior approval for any courses taken abroad that you wish to apply toward your journalism major. If your chosen country does not offer journalism education, you can spend the semester working on your required minor or Global Education requirement. The Journalism major offers enough flexibility to allow a semester abroad without jeopardizing your graduation date, and we will work with you to make that happen.